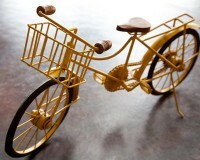 Thank you for considering Yellow Bicycle Catering Company for your event. 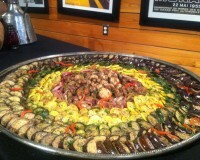 Whatever the type, size, or location we can help you plan and execute a great event. Please note, when creating a menu from individual items, per person pricing can vary. 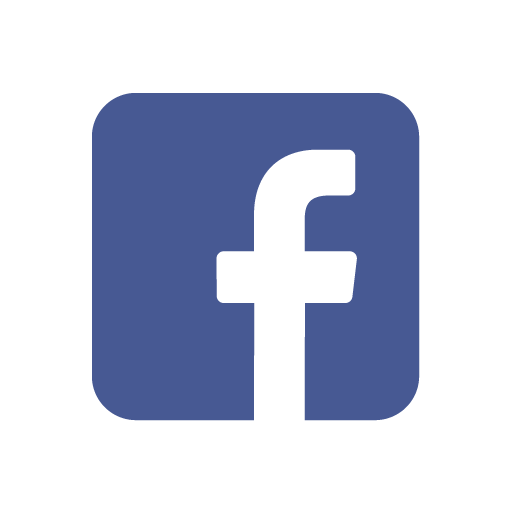 Please contact us for assistance in creating and pricing your customized menu. All pricing is plus 10% sales tax. 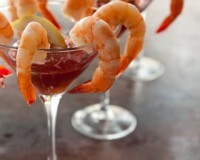 Tender shrimp and crab meat marinated in freshly squeezed lime juice, mixed with minced red onion and a hint of chili. The quintessential Italian salad… the perfect mouthful of fresh mozzarella, vine ripened tomato and garden fresh basil, drizzled with balsamic vinegar. 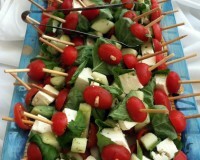 Greek salad on a stick! 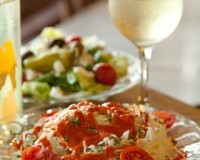 Cherry tomato, Greek feta and cucumber, all marinated in our delicious Greek dressing. Crisp toast spread with goat cheese, topped with a mix of roasted wild mushrooms and fresh thyme. Delicate blue crab claws marinated in our Greek vinaigrette. Fresh and delicious! Sweet tomatoes stuffed with herb cheese, bread crumbs, spinach and garlic, then sprinkled with Italian parsley. 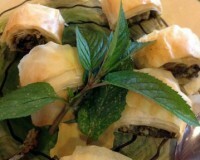 Delicate parcels made from grape leaves stuffed with long-grain rice, toasted pine nuts, fresh herbs and seasonings. Add lamb or beef. Your choice of large or jumbo shrimp, boiled to perfection in a special blend of spices. Served with our homemade cocktail sauce. 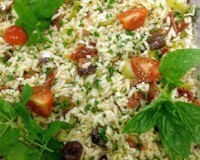 A Mediterranean classic. 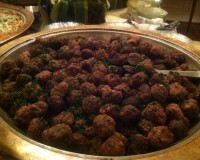 Lean ground beef flavored with garlic, oregano, parsley and a hint of mint. 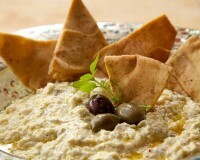 Served with our famous tzatziki sauce. The traditional Spanish seafood dish in two bites! Saffron scented rice with shrimp, scallops, mussels and our own chorizo sausage, breaded and delicately fried. Freshly grilled tuna served on a house made roll with spring mix and wasabi aioli. Tender white meat chicken is marinated in our own extra virgin olive oil, fresh lemon juice, rosemary and garlic, then grilled on skewers. The perfect comfort food appetizer. Rich, creamy macaroni and cheese coated in bread crumbs and fried. Grilled Portobello mushrooms, roasted red peppers and goat cheese baked in a puff pastry cup. Perfectly cooked shrimp bathed in house made pesto or perfectly seasoned with our own blend of Cajun spices. This savory Greek pastry combines creamy feta with onions, garlic and spices all wrapped in phyllo dough and baked until crisp. A classic Greek appetizer of flaky phyllo dough stuffed with spinach, onion and feta cheese presented with our own twist. Luscious and meaty crab claws are a favorite at any party! Offered either lightly fried or steamed and served with our homemade cocktail sauce. Large, char-grilled sea scallops or jumbo shrimp wrapped in Parma style ham and basted with extra virgin olive oil and spices. Topped with a honey-lime drizzle. Succulent, roasted pork tenderloin, sliced and served on a house made roll with peach chutney. These Foods Are Fabulous! Spread The Word. Succulent, fresh crab meat and minced artichoke hearts mixed with cream cheese and our own spices for a savory dip that is delicious. Served with crostini. Minced, freshly smoked salmon, rich cream cheese, capers, freshly cut dill, minced onions and cracked black pepper. Served with house made bagel chips. We cannot tell you how we make this one, but it is widely popular and highly addictive! Served with olives and house made bread. Tangy and robust, made with plump black olives, fresh feta cheese, sun-dried tomatoes, extra virgin olive oil and Greek spices. Served with crostini. A classic Sicilian relish of roasted, hand-chopped eggplant, onions, celery and bell peppers spiked with red wine vinegar. 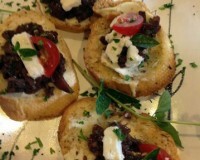 Garnished with capers and ripe olives, served with crostini. Eggplant is hand-chopped and combined with minced celery, red onion, garlic, freshly squeezed lemon juice, our own extra virgin olive oil and a hint of cilantro. Served with crostini. This Middle Eastern classic is a blend of pureed chick peas, tahini, freshly squeezed lemon juice, garlic and our own extra virgin olive oil. Served with crisp pita chips. Beautiful, Big Plates of Flavor From Around the World. 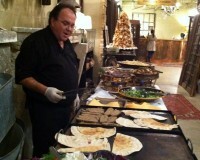 Platters and trays come with either crostini, crackers or house made breads. 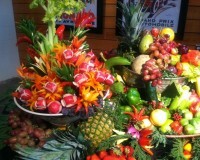 An artful display of the finest domestic and imported cheeses with delicious seasonal fruits. Serves 25. Your choice of large or jumbo shrimp, served perfectly iced. Choose naked or boiled in our special blend of spices, served with our homemade cocktail sauce or margarita marinated served with a zesty tomato salsa! Serves 25. 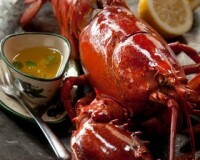 Your choice of steamed or cold fresh blue-crab claws, served perfectly plain or with Greek vinaigrette. Our famous cocktail sauce served on the side. Serves 25. 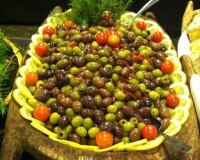 An assortment of delicious olives from around the world including nicoise, gaeta, kalamata, green queen and Moroccan. Serves 25. This array of seared, marinated fresh tuna accompanied by haricots vert, herbed new potatoes, ripe tomatoes, black olives, hard-boiled egg and anchovies is as delicious as it is elegant. Serves 25. Perfectly poached in white wine and served with capers, minced red onion, chopped hard-boiled egg, creamy dill sauce and Asian sauce. Served with freshly baked baguette slices. Serves 25. 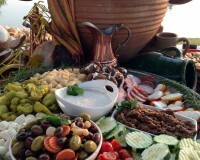 An array or crisp salonika peppers, tasty feta cheese, cool cucumbers, juicy tomato wedges and imported kalamata olives. Serves 25. Kalamata olives, sopressata, prosciutto, pepperoncini, cherry tomatoes, kefalograviera and fresh mozzarella cheese, served with bread sticks. Serves 25. Everything on our Anitpasti platter plus capicola, prosciutto wrapped asparagus spears ( in season), roasted red peppers stuffed with goat cheese, a variety of frutti di mare including garlic and butter royal reds or prawns, grilled or fried calamari and steamed mussels. Serves 25. Our moist and delicious turkey breast is served with house made Creole honey mustard, mayonnaise and freshly baked rolls. Mouth-watering savory with just the right amount of sweetness. Our ham comes with freshly made biscuits, honey mustard and mayonnaise. Citrus marinated, seared and roasted to perfection. 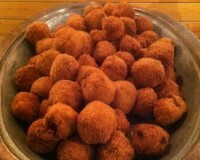 Served with house made rolls and a fruit chutney. Deliciously impressive, this station features beautifully roasted steak served with fresh rolls and our house made horseradish mayonnaise. Rich and delicious, marinated and served with a rich mushroom demi-glaze and plenty of heady horseradish. Seared and grilled to perfection. Marinated in the flavors of the Mediterranean and served with our famous tzatziki sauce or steak house style with tangy sauce and freshly grated horseradish. This lean and tender cut is served with house made rolls and horseradish mayonnaise. 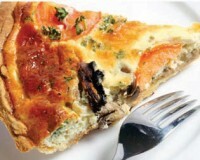 Tender and tasty omelets cooked to order. 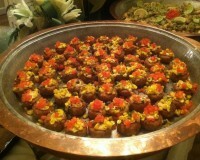 Your guests can choose from an assortment of cheeses and fresh vegetables with crawfish tails and tasty petite shrimp. Add succulent lump crab meat (at market price). Turn up the heat! Sauteed chipotle shrimp, snapper Vera Cruz or flame-grilled chicken, our freshly made shrimp and scallop ceviche and sweet corn Arepas oozing with melted cheese. Served with warm corn tortillas, fresh pico de gallo, sour cream and homemade guacamole. Stone ground, organic grits are served with a host of toppings including cheese and thinly sliced green onion. Add sausage or applewood smoked bacon. Tender grilled pieces of marinated beef, chicken, pork or lamb skewered with bell pepper, mushroom and onion. Tender, tasty lamb chops, classic gyros, or famous Greek style chicken and succulent pork souvlaki all grilled on site (outside space required for this station). 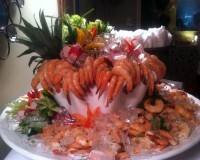 A choice of market fresh seafood, chicken or beef showcasing tastes from around the world. Choose Grecian, Asian, or Pacific Rim ingredients to flavor your sauté. Served with complementary rice dishes. A dramatic presentation sure to end the evening on a high note. Choose from rich bananas foster, tart and sweet cherries jubilee or citrus-scented crepes suzette. 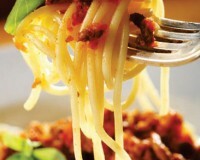 Selection of pastas served with choice of robust marinara sauce, creamy Alfredo sauce and oil & garlic. Choose from tender grilled chicken, sautéed fresh petite shrimp, julienne of seasonal vegetables, Italian style meatballs or sausage and freshly grated Parmesan cheese. Served with house made garlic rolls. 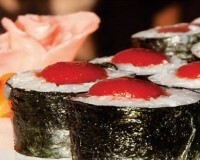 Created by hand and sliced in front of your guests, this station features the most popular sushi rolls. Spicy tuna roll with sriracha, California roll which combines tender crab meat with avocado and cucumber, bagel roll with classic deli combo of smoked salmon, cream cheese and avocado and vegetable roll which combines crisp cucumber with carrot, red bell pepper and avocado. All served with soy sauce and wasabi. 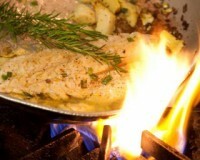 Get-togethers are cooked on site and require a minimum of 25 persons. Condiments, paper goods and utensils are included. Crisp romaine lettuce, freshly grated Parmesan and house made garlic croutons tossed in a traditional Caesar dressing. Add grilled chicken or shrimp. Fresh yellow fin tuna offered two ways… with diced celery and onion and just the right amount of pickle relish gently mixed with mayonnaise or with capers, a touch of red onion tossed with extra virgin olive oil and freshly squeezed lemon juice. Our famous blend of plump cooked shrimp and succulent lump crab meat, marinated with diced tomatoes, onions and green bell peppers in a light and delicious dressing of extra virgin olive oil, fresh lemon juice and Greek spices. A Fish Market favorite! Luscious lump crabmeat is combined with hand-cut onions and marinated in apple cider vinegar and light, high quality oil. Tender cooked fresh shrimp mixed with diced onions, celery, green bell pepper and spices in a traditional mayonnaise dressing. Delicate shreds of crisp romaine lettuce tossed with thinly sliced red and green onions, Greek spices, our own extra virgin olive oil and a splash of freshly squeezed lemon juice. Tender baby spinach topped with diced boiled egg, thinly sliced red onion, diced avocado and crumbled bacon, drizzled with a hot balsamic and bacon dressing. A smoky blend of roasted rosemary potatoes mixed with diced red onion, chopped celery and roasted red peppers in a savory mayonnaise and Dijon dressing. 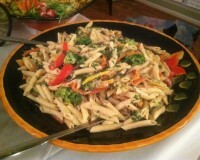 Crunchy julienne of cabbage, carrots, green and red bell peppers and red onion marinated in a sweet and sour vinaigrette. Angel hair cabbage, feta cheese, scallions and chopped parsley in a zesty dressing of Greek spices, extra virgin olive oil and freshly squeezed lemon juice. 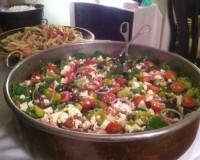 Juicy, ripe tomatoes, sliced onions and cucumbers, feta cheese and kalamata olives with our homemade Greek vinaigrette. Let’s Do Lunch; You Pick the PlaceBoxes include entrée, a choice of chips, slaw or fruit cup and a brownie. Made with yellow fin tuna, mayonnaise, diced celery and onion, sweet pickle relish and select spices. Served on your choice of bread or roll or over spring mix of lettuce. Tender cooked shrimp mixed with diced celery, onion, bell pepper and spices in a traditional mayonnaise dressing. Served on your choice of bread or roll or over a spring mix of lettuce. Tender, white meat chicken is marinated in garden-fresh rosemary, our own extra virgin olive oil, a hint of garlic and freshly squeezed lemon juice. 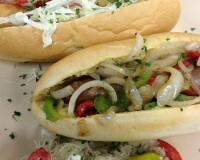 Perfectly grilled and served on a house made roll with caramelized onions and aioli. Snapper, catfish, shrimp, oyster, or crab cake served on a fresh French bread with lettuce, tomatoes, house made cocktail sauce and tartar sauce. Tex Mex shrimp with fresh salsa, shredded lettuce and cool sour cream. Grilled shrimp tossed with diced red onion, feta cheese and chopped cucumber. Eggplant, zucchini and red bell pepper with creamy feta spread. Smoked salmon delicately layered with crisp cucumber, freshly cut dill and cream cheese. Simple or sophisticated, the menu’s perfect because you create it. An assortment of our bite size desserts to include baklava, cheesecake, fruit tarts, brownies and Greek cookies. 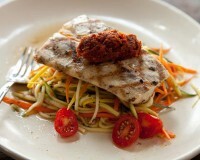 Start with a couple of salads, add some fresh vegetables and choose two of the Fish Market’s best selling entrées. It’s that easy. An assortment of our bite sized desserts including baklava, New York cheesecake, fruit tarts, key-lime bars and flour-less chocolate torte (assortment may vary). Make dinner a little more special with gourmet salads and chef prepared entrées like crab meat stuffed orange roughy or pecan crusted catfish with shrimp sauce. When only the best will do, choose among our most elaborate entrées, such as spice-crusted monkfish in lobster sauce or sliced beef tenderloin with Madeira sauce. We make it easy for you to get all the credit for an elegant dinner. 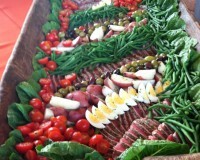 Antipasto Salad – diced Genoa salami, provolone cheese and vinaigrette marinated vegetables. Flamminero – matchstick thin broccoli stems in lemon juice, garlic and extra virgin olive oil. Eggplant Caponata – Eggplant, onions, tomatoes, anchovies, olives, pine nuts, capers and vinegar all cooked together in extra virgin olive oil. Market Fresh Fish – Freshly caught grouper, yellow fin tuna, mahi mahi, swordfish, salmon or amberjack. 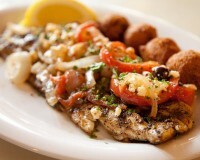 Choose from Greek, Cajun or lemon-pepper. Maple Glazed Pork Loin – Tender medallions of pork lightly glaxed with a touch of pure maple syrup. Spice Crusted Monkfish in Lobster Sauce – Medallions of sweet monkfish encrusted with garlic, fennel seed, cracked black pepper and rosemary topped with a light lobster sauce. Crab Claws – A fish Market favorite! Fresh blue crab claws served your way — lightly fried, sautéed in spices or marinated in our own vinaigrette. 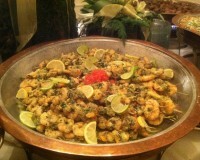 Jamaican Black Pepper Shrimp – Tender shrimp grilled and topped with tomatoes, onions and lively Caribbean seasonings. Valencian Paella – This traditional Spanish dish features saffron scented rice baked with fresh shrimp, mussels, scallops and our own homemade chorizo sausage. 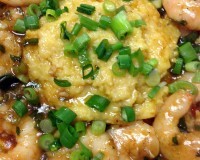 Shrimp Diane – Shrimp sautéed in butter with select herbs and spices and finished in a homemade seafood stack. Crab Meat Topped Grouper – Our market fresh grouper grilled to perfection and topped with a generous helping of sweet lump crab meat. Oysters Bienville Casserole – Fresh, succulent oysters baked in a cream sauce of bacon, mushrooms, garlic, sherry and peppers. Roast Chicken with Crawfish Stuffing – Roasted chicken dusted with Cajun seasonings and filled with a savory cornbread and crawfish stuffing. Braised Chicken Forestiere – Fresh bone-in chicken braised in a velvety brown sauce with mushrooms, onion and red and green bell peppers. Lamb Souvlaki – Succulent pieces of lamb marinated in extra virgin olive oil, fresh lemon juice, Greek spices and grilled to perfection. Sliced Beef Tenderloin with a Balsamic Reduction – Juicy, roasted beef served with an herbed red wine sauce. An assortment of our bite sized desserts including baklava, New York cheesecake, fruit tarts, homemade bread pudding with bourbon sauce, key-lime bars and flour-less chocolate torte (assortment may vary).